In Sweden, two fire engines, two police cars, and an emergency gas response team were all rushed to a neighbourhood in Stockholm. The alarm was raised by neighbours in relation to an offensive odour in their block of flats. The fire brigade arrived on site and quickly found out that the offending odour was indeed smelly, but was, in actual fact, harmless. 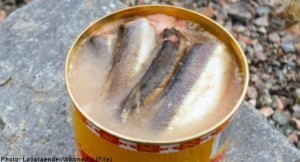 The source was the Swedish delicacy, surströmming. Said Sven-Erik Olsson from the police’s command centre to the TT news agency. “They’ve got gas in the building, so I find it a bit strange that they called us. They ought to know what it smells like when you turn on a gas stove. It doesn’t smell like surströmming at all”. Surströmming, is a traditional Swedish delicacy of fermenting Herring. However, its odour is well known for being offensive, and as a result, it is usually eaten outdoors. In autumn, it is not uncommon for Swedes to have a surströmmingsskiva (a fermented herring party). According to the Stockholm fire department, this is not the first time that an emergency call has resulted from a fermented herring party. More on this Nordic tale can be found here.